NOTE: The condo has been recently renovated in Winter of 2017! Our family has been vacationing in the area since the early 2000's. 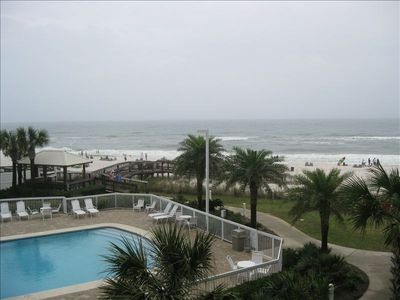 Our family decided to purchase this condo in 2012 in order to share our unforgettable experiences with many others. 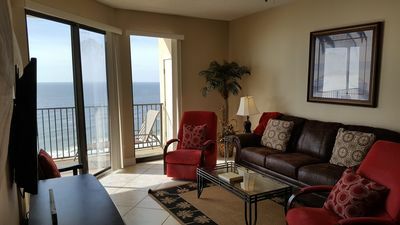 We have worked very hard to incorporate all of the best elements of our previous renting experiences into this condo in order to let others experience Orange Beach in the best possible way. 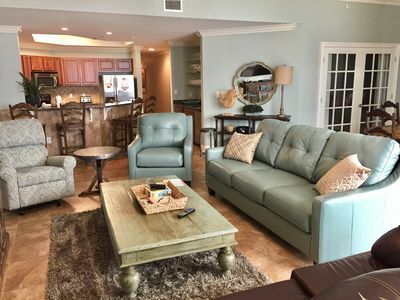 Our condo is one of the newest and fastest-growing rentals in the area, having gained exceptional rating and rave reviews from every guest, and regularly hosting loyal returners! The Unit is on the 11th floor of a quite complex (Phoenix 8), where privacy is always a given even during the busy Summer. 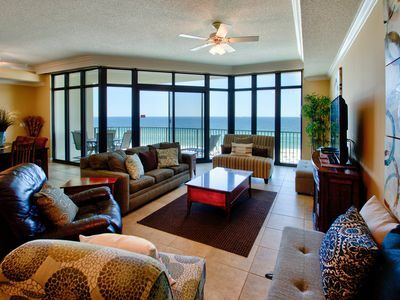 This is a beachfront condo in every sense of the word, as we are touching the sand. 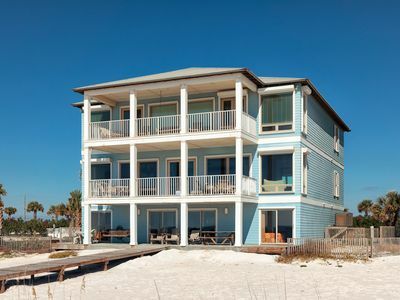 The wrap-around balcony offers an unmatched view of the beach from both the living room and the master bedroom. 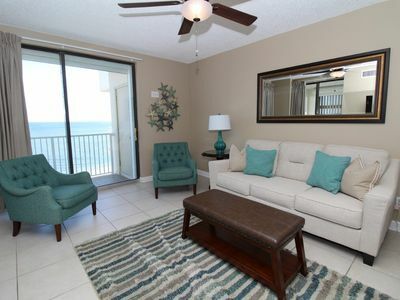 The condo is furnished just like a house and features all major and most minor appliances--we have everything you'll ever need from blenders to washers and dryers and everything in-between. The unit is always cleaned before and after each guest stay to ensure cleanliness. 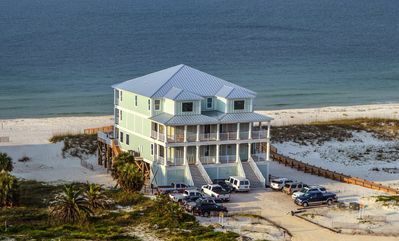 Phoenix 8 itself is relatively small compared to its neighbors which means that parking in the front is always available and the concierge/cleaning services are more readily available to all guests. This also means uncrowded lobbies and elevators. The complex also features a full service help desk in the lobby staffed 24/7 ready to attend to any and all needs for all guests. 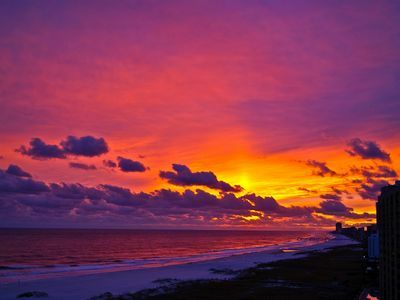 They can provide very helpful recommendations for restaurants, local attractions, and 'Off the Beaten Path' ideas! 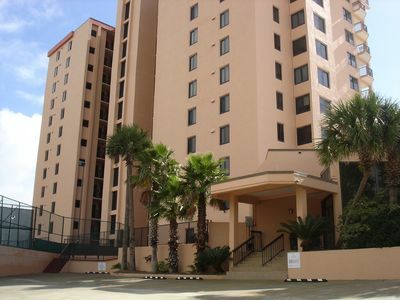 The complex has tennis courts as well as a basketball court in the front while also featuring a sauna and indoor gym. 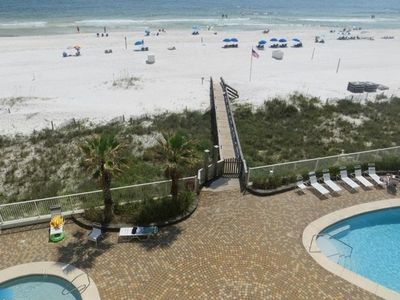 The building is equipped with an an indoor pool, an even larger outdoor pool as well as a separate kiddie pool. 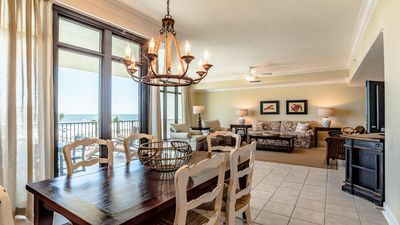 There are also multiple grills and tables by the outside pool so you can enjoy grilling your dinner and relaxing with friends and family while the kids swim! The central location could not be more perfect. The complex is just minutes from all local grocery stores and theme parks. 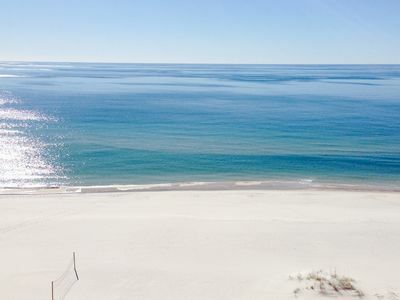 Escape with your loved ones to this spacious 3-bedroom, 2-bathroom condominium along the sugar-white sands of Orange Beach. 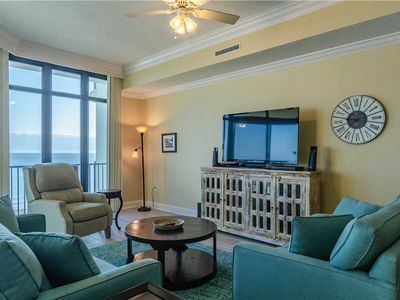 Located on the 11th floor of Phoenix VIII, the getaway with wonderful amenities, sleeps eight and has exquisite tile throughout the condo and on the Gulf-front balcony. 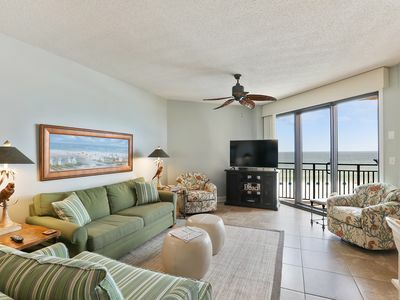 The condo received substantial upgrades in 2017 highlighted by renovated bathrooms with granite countertops and tiled showers; new stainless-steel kitchen appliances and granite countertops; new living room furniture and fresh paint throughout. · Warm and inviting living area with Queen sleeper sofa, love seat, armchair, and a large, wall-mounted flatscreen television. · Rustic tile backsplash, new stainless-steel appliances, and granite countertops in fully equipped kitchen. 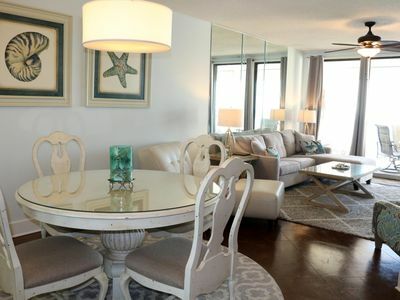 · Stools for three at breakfast bar and chairs for six around dining area table. · Splendid master bedroom with King-size bed, balcony access through floor-to-ceiling sliding-glass doors, and a flatscreen television. · Master bathroom now featured a tiled shower and bathtub combination, large single-sink vanity, and granite countertop. · Second bedroom with a nautical blue decor has two twin-size bed and a flatscreen TV. · Second bathroom has a single-sink vanity, granite countertop and a new tiled, walk-in shower. 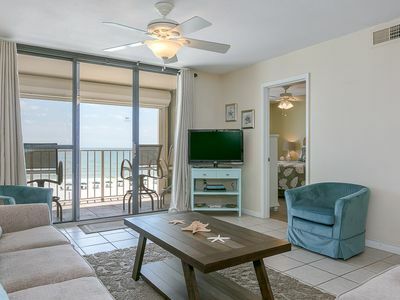 · Third bedroom with a coastal feel has a Queen-size bed and a flatscreen TV. · Large, front-loading washer and dryer. 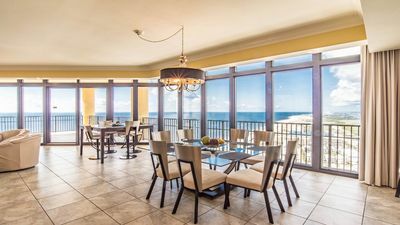 · Spectacular Gulf-front views await guests from the tiled balcony with ample seating, including a table with four chairs and a chaise lounge. Check-In: For arrivals from March 8 thru September 1, Check-in begins at 4 PM. 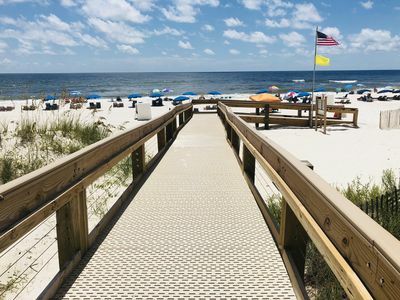 For arrivals from September 2 thru March 7, Check-in begins at 3 PM. You may check-in at the front desk, just like a hotel! Check-Out: For arrivals from March 8 thru September 1, Check-out is no later than 10 AM. For arrivals from September 2 thru March 7, Check-out is no later than 11 AM. Phoenix West w/ Lazy River!! 2nd Floor!! Recently Updated! !